← Babywearing Groups in New Zealand – Spotlight on Slingbabies. In the lead up to New Zealand Babywearing Week (10 – 16 October 2011) we will be focusing on the six main types of baby carriers. 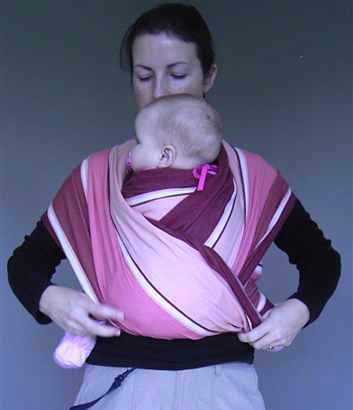 So far we have covered pouch slings and stretchy wraps. This week we’re focusing on woven wraps. Keep an eye on the New Zealand Babywearing Week week Facebook page too this week for more information about woven wraps including ‘how to’ videos and photos. Woven wraps are made from purpose-loomed fabric, averaging 70-80cm wide and between 2.7 to 5.5m long. This is tied in a variety of ways to create whatever carrier is needed. There are a few main differences between stretchy and woven wraps however. Woven wraps are wider and much more supportive than stretchy wraps. They are often made overseas by very well-paid workers and then imported, which accounts for the chunkier pricetag! You can back carry with a woven wrap, which gives a lot more freedom. Parents of subsequent babies often choose to back carry from early on, once they’ve gained confidence carrying the first baby. There are many carries you can do with a woven wrap – Front Wrap Cross Carry (like the Front Pocket Cross Carry for a stretchy wrap but without the ‘stuff down the front’ step), Front Cross Carry (FCC), Hip Cross Carry, Back Wrap Cross Carry, Secured High Back Carry (SHBC), Ruck Carry the list goes on! A slight downside to woven wraps is that you need to re-tie them every time you wrap (with the exception of the FCC). But you’ll get so quick at it, it won’t be a problem soon. 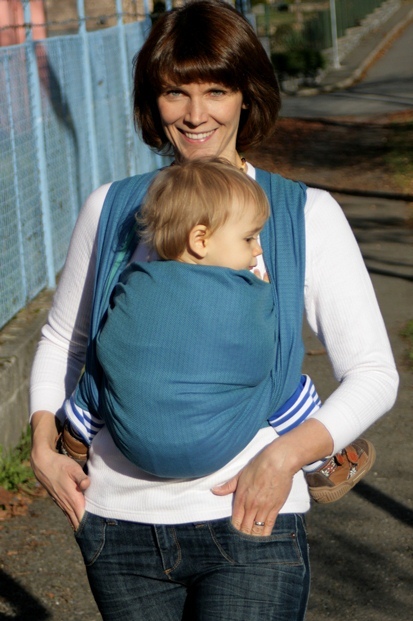 My personal favourite carry is the SHBC, because it suits newborn to toddler, and the first diagonal passover keeps baby nice and secure while you arrange the rest. The photo above shows a Front Wrap Cross Carry in a Wrapstar Neopolitan. See how there is one layer of fabric over baby, then the sides cross over for support? If you like you can bunch the sides and keep only one layer across baby (like the image at the top of this post with a Storchenwiege – note the optimal positioning for baby’s hips and spine – knees up, bum down), it’s still supportive and good for hot weather. 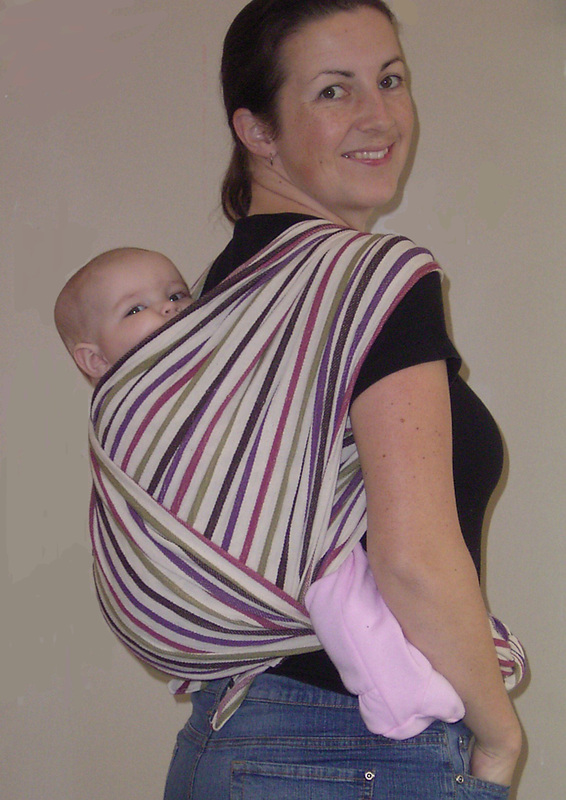 This next photo shows a Back Wrap Cross Carry in a Wrapstar Berry Stripes wrap at 5 months old. Baby sits down in the small of your back. I like this as it’s quite a symmetrical carry method and you can adjust the chest belt easily. 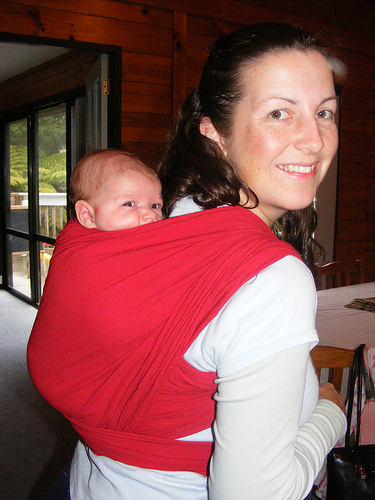 The next photo shows a Secured High Back Carry in a Calin Bleu red wrap at 5 weeks old. Not as symmetrical as the BWCC but still a goodie! Check out Paulus’ SHBC video too and have a go. For more detailed information about woven wraps, photo instructions and videos, please visit Slingbabies. Remember to check out the New Zealand Babywearing Week facebook page this week for more information about stretchy wraps too. This entry was posted in Woven Wraps and tagged calin bleu, New Zealand Babywearing Week, storchenwiege, woven wraps, wrapstar. Bookmark the permalink.